Where everything we do is just for you! Step into this Montana High Country and see how convenient your time away from home will be. 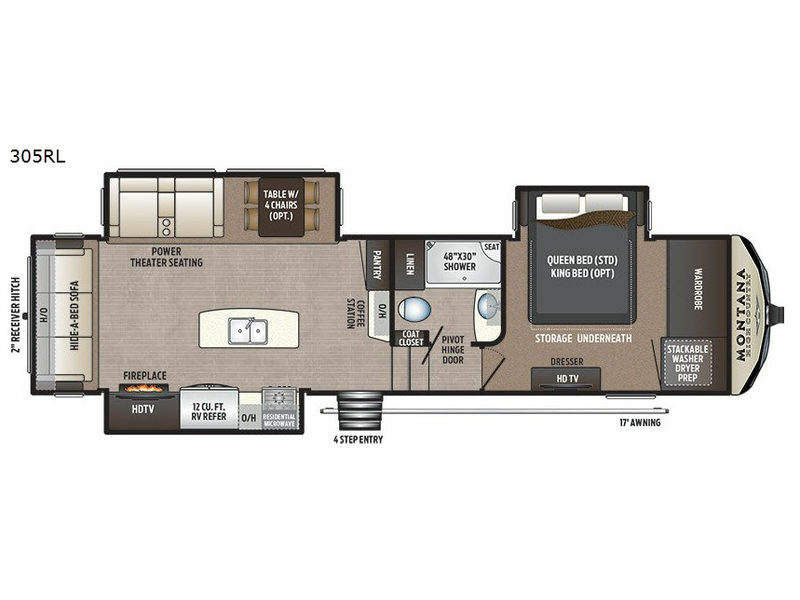 This fifth wheel allows you to move around freely with the triple slides and the windows give you beautiful views. The main living and kitchen area offers a center island for extra prep space, a coffee station, a 12 cu. ft. RV refrigerator, and a HD LED TV above an electric fireplace controlled by a remote to keep you warm all year long. The front bedroom will become your retreat away from it all with a shiplap design headboard and a 32" HD LED TV, plus there is plenty of storage for all your things. You might even like to hitch up your own bike rack to the 2" receiver hitch on the rear, plus more! When heading out and setting up in a Keystone Montana High Country fifth wheel you will appreciate the Dexter E-Z Lube axles, Max Turn front cap and radius frame with Hitch Vision, and an enormous drop frame pass-through storage compartment to name a few features. Inside you will find luxury and comfort with the 78" tall main slide out with panoramic windows providing beautiful views, more bathroom storage with three drawers in a residential vanity, All-In-One Furrion controls for the TV, radio and fireplace, Beauflor flooring with a 7 year cold cracking warranty, and a residential ceiling fan for natural air movement. It's time to find the premium fifth wheel you can't live without, and start making memories in a Montana High Country today! 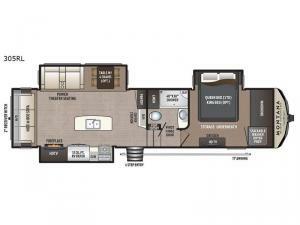 Have a question about this floorplan? Shower Size 48" x 30"
A representative has been notified and will be with you shortly. We're sorry. We were unable to find any results for this page. Please give us a call for an up to date product list or try our Search and expand your criteria. Please complete the simple form below to receive Krazy Kelly's Lowest Price! A team member will get back with you as soon as possible, during normal business hours. Do you have a Trade In? What is your primary preferred way to be contacted? What is your secondary preferred way to be contacted? Beckleys RVs is not responsible for any misprints, typos, or errors found in our website pages. Any price listed excludes sales tax, registration tags, and delivery fees. All prices may not include Beckley’s Camping Center’s 145 point pre-delivery inspection. Manufacturer-provided pictures, specifications and features may be used as needed. Inventory shown may be only a partial listing of the entire inventory. Please contact us at 800-424-2267 for availability as our inventory changes rapidly. All calculated payments are an estimate only and do not constitute a commitment that financing or a specific interest rate or term is available.